Harrods is a department store located on Brompton Road in Knightsbridge, London. It is owned by the state of Qatar via its sovereign wealth fund, the Qatar Investment Authority. The Harrods brand also applies to other enterprises undertaken by the Harrods group of companies including Harrods Estates, Harrods Aviation and Air Harrods, and to Harrods Buenos Aires, sold by Harrods in 1922 and closed as of 2011[update]. The store occupies a 5-acre (20,000 m2) site and has 330 departments covering 1.1 million square feet (102,193.344 m2) of retail space. It is the largest department store in Europe and lays claim to having its own unique postcode, SW1X 7XL. In 1824, at the age of 25, Charles Henry Harrod established a business at 228 Borough High Street in Southwark. He ran this business, variously listed as a draper, mercer, and a haberdasher, until at least 1831. During 1825, the business was listed as 'Harrod and Wicking, Linen Drapers, Retail', but this partnership was dissolved at the end of that year. His first grocery business appears to be as 'Harrod & Co. Grocers' at 163 Upper Whitecross Street, Clerkenwell, E.C.1., in 1832. In 1834, in London's East End, he established a wholesale grocery in Stepney at 4 Cable Street with a special interest in tea. In 1849, to escape the vice of the inner city and to capitalise on trade to the Great Exhibition of 1851 in nearby Hyde Park, Harrod took over a small shop in the district of Brompton, on the site of the current store. 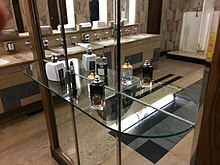 Beginning in a single room employing two assistants and a messenger boy, Harrod's son Charles Digby Harrod built the business into a thriving retail operation selling medicines, perfumes, stationery, fruits and vegetables. Harrods rapidly expanded, acquired the adjoining buildings, and employed one hundred people by 1881. However, the store's booming fortunes were reversed in early December 1883, when it burnt to the ground. Remarkably, Charles Harrod fulfilled all of his commitments to his customers to make Christmas deliveries that year—and made a record profit in the process. 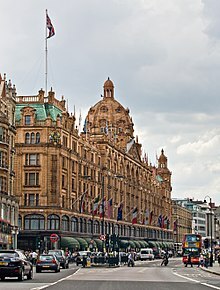 In short order, a new building was built on the same site, and soon Harrods extended credit for the first time to its best customers, among them Oscar Wilde, Lillie Langtry, Ellen Terry, Charlie Chaplin, Noël Coward, Gertrude Lawrence, Laurence Olivier and Vivien Leigh, Sigmund Freud, A. A. Milne, and many members of the British Royal Family. A chance meeting in London with businessman, Edgar Cohen, eventually led to Charles Harrod selling his interest in the store for £120,000 via a stock market flotation in 1889. The new company was called Harrod's Stores Limited. Sir Alfred James Newton became chairman and Richard Burbidge managing director. Financier William Mendel was appointed to the board in 1891 and he raised funding for many of the business expansion plans. Richard Burbidge was succeed in 1917 by his son Woodman Burbidge and he in turn by his son Richard in 1935. The department store was acquired by House of Fraser in 1959, which in turn was purchased by the Fayed brothers in 1985. In 1994, Harrods was moved out of the House of Fraser Group to remain a private company prior to the group's relisting on the London Stock Exchange. Following denial that it was for sale, Harrods was sold to Qatar Holdings, the sovereign wealth fund of the State of Qatar in May 2010. A fortnight previously, chairman of Harrods since 1985, Mohamed Al-Fayed, had stated that "People approach us from Kuwait, Saudi Arabia, Qatar. Fair enough. But I put two fingers up to them. It is not for sale. This is not Marks and Spencer or Sainsbury's. It is a special place that gives people pleasure. There is only one Mecca." The sale was concluded in the early hours of 8 May, when Qatari Prime Minister Hamad bin Jassim bin Jaber Al Thani came to London to finalise the deal, saying that the acquisition of Harrods would add "much value" to the investment portfolio of Qatar Holdings while his deputy, Hussain Ali Al-Abdulla, called it a "landmark transaction". A spokesman for Mohamed Al-Fayed said "in reaching the decision to retire, [Fayed] wished to ensure that the legacy and traditions that he has built up in Harrods would be continued." Harrods was sold for £1.5 billion; half of the sale will be used to pay bank debts of £625 million. With the previously operating Disney Cafe and Disney Store, the Disney at Harrods partnership added the Bibbidi Bobbidi Boutique salon on 25 November 2013 to those stores. 1824: Charles Henry Harrod starts his first business as a draper, at 228, Borough High Street, Southwark, London. 1914: Harrods opens its first and only foreign branch in Buenos Aires, Argentina. It became independent of Harrods in the late 1940s but still traded under the Harrods name usable only in Argentina Harrods Buenos Aires. 1914: Harrods Furniture Depository built in Barnes, near Hammersmith Bridge. 1919: Harrods buys the Manchester department store, Kendals; it took on the Harrods name for a short time in the 1920s, but the name was changed back to Kendals following protests from staff and customers. 1920: Harrods buys London department store Swan & Edgar and Manchester retailer Walter Carter Ltd.
1923: Mah-Jongg (lemur) was bought by Stephen Courtauld and Virginia Courtauld (née Peirano). Mah-Jongg lived with the Courtaulds for fifteen years, accompanying the couple on their travels and changes of residence, including Eltham Palace in the Royal Borough of Greenwich. 1928: Harrods buys London department store D H Evans. 1946: Harrods buys the Sheffield department store, John Walsh. 1949: Harrods buys William Henderson & Co, a Liverpool department store. 1955: Harrods buys Birmingham department store Rackhams. 1959: The British department store holding company, House of Fraser, buys Harrods, fighting off competition from Debenhams and United Drapery Stores. 1983: A terrorist attack by the Provisional IRA outside the Brompton store kills six people. 1985: The Fayed brothers buy House of Fraser including Harrods Store for £615 million. 1986: The small town of Otorohanga in New Zealand briefly changed its name to Harrodsville in response to legal threats made by Mohamed Al-Fayed against a person with the surname of Harrod, who had used the name "Harrod's" for his shop. 1993: An IRA terrorist attack injures four people. 1997: An English court issues an injunction to restrain the Buenos Aires Harrods store from trading under the Harrods name. 2000: A Harrods shop opens on board the RMS Queen Elizabeth 2, owned by the Cunard Line. 2006: The Harrods "102" shop opens opposite the main shop in Brompton Road; it features concessions like Krispy Kreme and Yo! Sushi, as well as florists, a herbalist, a masseur, and an oxygen spa. The store closed in 2013. 2010: Fayed announces he has sold Harrods to the Qatar Investment Authority (QIA). It has been reported that the QIA paid £1.5 billion for the Knightsbridge store, in a deal signed in the early hours of 8 May 2010. 2010: Harrods looks at the possibility of expanding to China and opening a new shop in Shanghai. Michael Ward, managing director of Harrods, said, "There are other areas of the world where we could operate profitably." The number of Chinese shoppers visiting Harrods is increasing, and the average spent by a Chinese shopper is three times that of any other nationality. 2012: The figurative sculptures that once adorned the Harrods food hall are consigned for sale at West Middlesex Auction Rooms. The two Mermaids supporting a giant Clam and the Stag and Boar sheltering under an English Oak are purchased by Greaves & Thomas for inclusion in an elaborate fountain for Ryde, Isle of Wight. The shop's 330 departments offer a wide range of products and services. Products on offer include clothing for women, men, children and infants, electronics, jewellery, sporting gear, bridal trousseau, pet accessories, toys, food and drink, health and beauty items, packaged gifts, stationery, housewares, home appliances, furniture, and much more. A representative sample of shop services includes 23 restaurants, serving everything from high tea to tapas to pub food to haute cuisine; a personal shopping-assistance programme known as "By Appointment"; a watch repair service; a tailor; a dispensing pharmacy; a beauty spa and salon; a barbers shop; Ella Jade Bathroom Planning and Design Service; private events planning and catering; food delivery; a wine steward; bespoke picnic hampers and gift boxes; bespoke cakes; bespoke fragrance formulations; and Bespoke Arcades machines. In October 2009, Harrods Bank started selling gold bars and coins that customers could buy "off the shelf". The gold products ranged from 1 g to 12.5 kg, and could be purchased within Harrods Bank. They also offered storage services, as well as the ability to sell back gold to Harrods in the future. In August 2010, in a letter to The Daily Telegraph, chairman Mohamed Al-Fayed revealed that he had burnt Harrods royal warrants, after taking them down in 2000. Harrods had held the Royal warrants since 1910. Describing the warrants as a "curse", Al-Fayed claimed that business had tripled since their removal. The Duke of Edinburgh removed his warrant in January 2000, and the other warrants were removed from Harrods by Al-Fayed in December, pending their five-yearly review. The Duke of Edinburgh had been banned from Harrods by Al-Fayed. Film of the burning of the warrants in 2009 was shown in the final scene of Unlawful Killing, a film funded by Al-Fayed and directed by Keith Allen. Since the deaths of Diana, Princess of Wales, and Dodi Fayed, Mohamed Al-Fayed's son, two memorials commissioned by Al-Fayed have been erected inside Harrods to the couple. The first, located at the base of the Egyptian Escalator, was unveiled on 12 April 1998, consisting of photographs of the two behind a pyramid-shaped display that holds a wine glass smudged with lipstick from Diana's last dinner as well as what is described as an engagement ring Dodi purchased the day before they died. The second memorial, unveiled in 2005 and located by the escalator at door three is entitled Innocent Victims, a bronze statue of the two dancing on a beach beneath the wings of an albatross, a bird said to symbolise the "Holy Spirit". The sculpture was created by William Mitchell, a close friend of Al-Fayed and artistic design advisor to Harrods for 40 years. Al-Fayed said he wanted to keep the pair's "spirit alive" through the statue. After the death of Michael Jackson, Al-Fayed announced that they had already been discussing plans to build a memorial statue. This was unveiled in April 2011 at the rear of Craven Cottage football ground (Fulham F.C.) but removed in September 2013 on the orders of new club owner Shahid Khan. In 1989 Harrods introduced a dress code for customers. The store turns away people whose dress is not in compliance with the code. Forbidden items include uniforms; cycling shorts; high-cut shorts, Bermuda or beach shorts; swimwear; athletic singlets; flip flops or thong sandals; bare feet; bare midriff; or wearing dirty or unkempt clothing. Patrons found not in compliance with the code and barred from entry include pop star Kylie Minogue, Jason Donovan, Luke Goss, a soldier in uniform, a Scout troop, a woman with a Mohican hair cut, and the entire first team from FC Shakhtar Donetsk who were wearing tracksuits. The store occupies a 5-acre (20,000 m2) site and has over one million square feet (90,000 m2) of selling space in over 330 departments making it the biggest department store in Europe. The UK's second-biggest shop, Selfridges, Oxford Street, is a little over half the size with 540,000 square feet (50,000 m2) of selling space., By comparison Europe's second-largest department store the KaDeWe in Berlin has a retail space of 650,000 square feet (60,000 m2). Harrods and Mohamed Al-Fayed were criticised for selling real animal fur with regular protests organised outside Harrods. Harrods is the only department store in Britain that has continued to sell fur. Harrods was sharply criticised in 2004 by the Hindu community for marketing a line of feminine underwear (designed by Roberto Cavalli) which featured the images of Indian goddesses. The line was eventually withdrawn and formal apologies were made. Harrods has been criticised by Guardian journalist Sali Hughes as "deeply sexist" for making female employees wear six kinds of makeup at all times without requiring this of male employees. They have also been criticised after reports came out claiming that Harrods staff told a black woman that she would not be employed unless she chemically straightened her hair, stating that her natural hair style was "unprofessional". Harrods' restaurants and cafes included a 12.5% discretionary service charge on customers' bills, but failed to share the full proceeds with kitchen and service staff. Several employees joined the UVW union, which claimed that 483 affected employees were losing up to £5,000 each in tips every year. A surprise protest and roadblock organised by the union outside Harrods during the January sales of 2017 was followed by an announcement that "an improved tronc system" would give 100% of service charges to staff. In December 2017, a website glitch resulted in £950 Aspinal of London bargain designer bags being listed for £8 but Harrods refused to honour the price. On 27 October 2008, in the case of Harrods Ltd v. Harrods Limousine Ltd, the Harrods store applied to the Company Names Tribunal under s.69(1)(b) Companies Act 2006 for a change of name of Harrods Limousine Ltd, which had been registered at Companies House since 14 November 2007. The application went un-defended by the respondent and the adjudicator ordered on 16 January 2009 that Harrods Limousine Ltd must change their name within one month. Additionally the respondent was ordered not to cause or permit any steps to be taken to register another company with an offending name which could interfere, due to its similarity, with the goodwill of the applicant. Finally, Harrods Limousine Ltd was ordered to pay Harrods' costs for the litigation. Asma al-Assad, the wife of the President of Syria, Bashar al-Assad, used an alias to shop at Harrods despite economic sanctions imposed by the European Union that froze funds belonging to her and her husband. In March 2014, a parody story in Middle East satirical website The Pan-Arabia Enquirer claimed that following a dispute among Gulf countries, Harrods' Qatari owners had banned shoppers from the United Arab Emirates, Bahrain and Saudi Arabia from entering the store. The article was reported as fact on a cover story in Pakistan's The News International. Chris Bennett and Colin Cameron (7 February 2000). Behind the Scenes at Harrods. Andre Deutsch. ISBN 0-233-99617-6. Tim Dale (November 1986). Harrods: The Store and the Legend. Pan. ISBN 0-330-29800-3. Jenners, known as the "Harrods of the North"
^ a b c Jahshan, Elias (16 October 2017). "Harrods smashes £2bn sales mark for the first time - Retail Gazette". Retail Gazette. Retrieved 10 October 2018. ^ "investor buys UK department store Harrods". Reuters. 2010. Retrieved 5 June 2017. 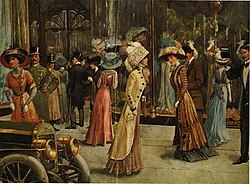 ^ "History of Harrods department store". BBC News. 8 May 2010. Retrieved 3 July 2017. ^ Rate Books April 1824 to April 1831 held at Local History Library, Borough High Street, Southwark, London. ^ 1830 Critchett’s Directory, London. ^ "Issue 18210, published on the 10th. January, 1826, page 57". London-gazette.co.uk. Retrieved 22 August 2010. ^ Callery, Sean (1991). Harrods Knightsbridge; The Story of Society's Favorite Store. London: Ebury Press. pp. 17, 37, 38, 40. ^ "The First Moving Staircase in England." The Drapers' Record, 19 November 1898: 465. ^ a b c d e f "Mohammed Fayed sells Harrods store to Qatar Holdings". BBC News. BBC. 8 May 2010. Retrieved 8 May 2010. ^ "Qatar, the tiny Gulf state that bought the world". Independent. 11 May 2010. Retrieved 22 August 2010. ^ Bower, Tom (10 May 2010). "Why Al-Fayed sold Harrods, for £1.5 billion". This Is Money. Retrieved 22 August 2010. ^ a b "Mohammed Fayed: Why I Sold Harrods". Evening Standard. 26 May 2010. Archived from the original on 24 October 2012. Retrieved 22 August 2010. ^ "Disney and Harrods launch new retail experience". Retail Gazette. 15 November 2013. Retrieved 7 February 2017. ^ "Omar, 19, joins Harrods board". The Guardian. guardian.com. 18 November 2006. Retrieved 9 November 2015. ^ "BESPOKE ARCADES Elite Racer Pro Simulator". Harrods. Retrieved 30 August 2013. ^ "Harrods Starts Selling Gold Bars". The London Insider. 16 October 2008. Retrieved 16 October 2009. ^ a b Mendick, Robert (26 June 2011). "Anger as Mohamed Fayed burns Harrods royal warrants". The Daily Telegraph. London. ^ Hardman, Robert (23 December 2000). "Everything must go as Harrods cuts royal links". London: The Daily Telegraph. ^ Rick Steves, Getting Up To Snuff In London, /www.ricksteves.com. ^ Harrods unveils Diana, Dodi statue, CNN.com, 1 September 2005. ^ "Diana bronze unveiled at Harrods". BBC News. BBC. 1 September 2005. Retrieved 8 May 2010. ^ "Michael Jackson memorial statue planned for Harrods, says Mohamed Al-Fayed". The Daily Telegraph. London: Telegraph Media Group. 29 June 2009. Retrieved 26 June 2009. ^ "Michael Jackson is HIStory: Controversial statue removed from Fulham stadium Craven Cottage". The Independent. 25 September 2013. Retrieved 26 September 2013. ^ a b "Don't come as you are: There is only Harrods dress code". The Independent. 18 July 1994. Retrieved 22 August 2010. ^ "'Too fat for Harrods' woman to sue". BBC News. 15 December 1997. Retrieved 4 May 2018. ^ "Harrods bans soldiers on Poppy Day". Daily Mail. 18 November 2006. Retrieved 22 August 2010. ^ "'Harrods bars' Hampshire Scouts wearing woggles". BBC News. 18 March 2010. Retrieved 22 August 2010. ^ "Harrods snub 'Mohican' fundraiser". BBC News. 15 July 2009. Retrieved 22 August 2010. ^ "Harrods bars Shakhtar before they face Fayed's Fulham". BBC News. 17 February 2010. Retrieved 22 August 2010. ^ Clegg, Alicia (13 December 2005). "Hot Shops: Retail Revamps". Businessweek.com. Retrieved 26 June 2009. ^ "Harrods fur protests". Vegies.org.uk. 27 June 2009. Retrieved 26 June 2009. ^ "The Coalition to Abolish the Fur Trade". Caft.org.uk. Archived from the original on 20 June 2009. Retrieved 26 June 2009. ^ "Harrods apology over Hindu bikinis". BBC News. BBC. 9 June 2004. Retrieved 9 June 2004. ^ Hughes, Sali (4 July 2011). "Harrods' line on beauty is 'deeply sexist'". www.guardian.co.uk. Retrieved 7 July 2011. ^ "Black woman told to straighten hair if she wants Harrods job, MPs told". The Telegraph. Retrieved 26 January 2017. ^ Wood, Zoe (2 January 2017). "Harrods workers say company keeps up to 75% of restaurant service charge". The Guardian. Retrieved 2 January 2017. ^ Butler, Sarah (7 January 2017). "Harrods demonstrators block doorways during tips protest at store". The Guardian. ISSN 0261-3077. Retrieved 27 February 2019. ^ Wood, Zoe (20 January 2017). "Harrods stops taking cut of tips in its restaurants after protests". The Guardian. ISSN 0261-3077. Retrieved 27 February 2019. ^ Lauren Miligan (20 March 2011). "European Blacklist". Vogue. Archived from the original on 23 March 2012. ^ "Qatar banned Saudis from Harrods? No..." Haaretz. 10 March 2014. 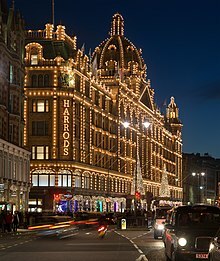 Wikimedia Commons has media related to Harrods.